Anyone looking to save money on their car petrol bills and also drive a little more efficiently and help the environment, may be interested in a new car sensor called the CleverDrive that has been created by German company Ascora. Once fitted to your car the CleverDrive sensor feeds data back to your mobile device which is loaded with the CleverDrive companion application that currently supports either Android or iOS devices. 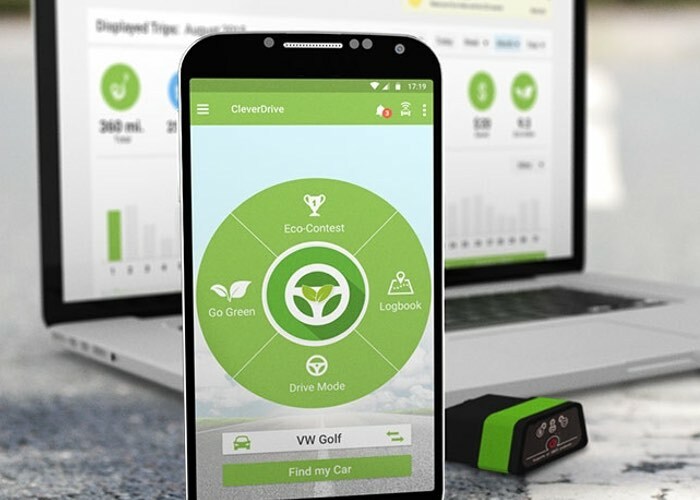 CleverDrive is capable of providing you with information on your cars engine and your driving behaviour, allowing you to save up to 30 percent off your petrol bills say its creators. Watch the video below to learn more about this useful sensor that can be attached to almost any car manufactured after 1996. For most of us our car is a daily companion. We drive to work, to the grocery store, into our holidays, and everywhere else. Although our cars get more sensors every year, we still use it the way we did 20 years ago. Once you start your car, CleverDrive automatically starts analyzing of your driving behavior. CleverDrive runs invisibly in the background on your smartphone, but of course you can always launch the app to bring it into the foreground in order to get real-time data from your car. Next to basic outputs such as speed or engine load, you can also see valuable information like your Eco-Index. The Eco-Index shows you how fuel-efficient and environmentally friendly you drive, and the app gives you clues how to improve that. Thereby, you can save up to 30% fuel and CO2. This helps the environment and saves lot of money! Jump over to the Kickstarter crowdfunding website to learn more and also make a pledge from €39 to own one of the very first CleverDrive sensors off the production line.